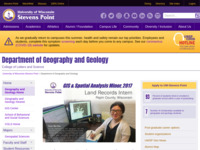 This clearinghouse lists relevant web sites for physical geographers as well as other physical scientists. Web sites are categorized under the following headings: biogeography and ecology, geomorphology and hydrology, hydrology and water resources, soil science, reference materials and publications, information servers, climatology and meteorology, earthquakes, geochemistry, hydroecology, paleontology, volcanoes, and earth science and geology. There are approximately 200 web sites listed on this resource and they range from sites sponsored by non-profit groups and scientific entities, to government-funded organizations and academic centers.